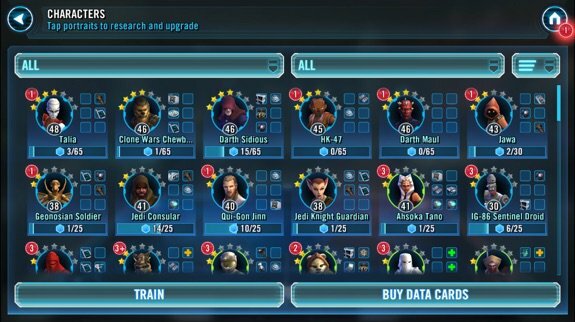 An acquaintance asked me to get in on Star Wars: Galaxy of Heroes and help their group of galactic rabble (aka "guild"). I've played it off and on for several months now, and I think I can safely say that thanks in large part to EA, this game has no soul. 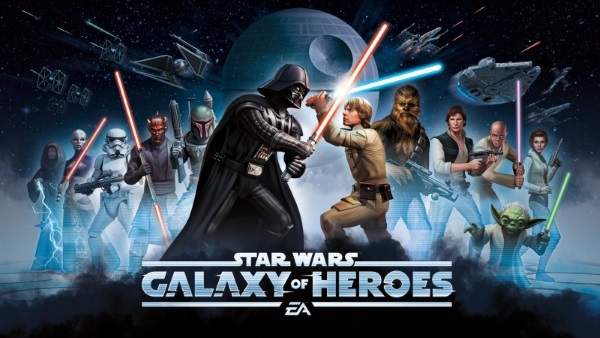 Built on the free-to-play model, GoH to it's credit ties in closely with the Star Wars universe. Many of the classic heroes from the franchise are present; Darth Vader, Yoda, Emperor Palpatine, Luke Skywalker, the list goes on. 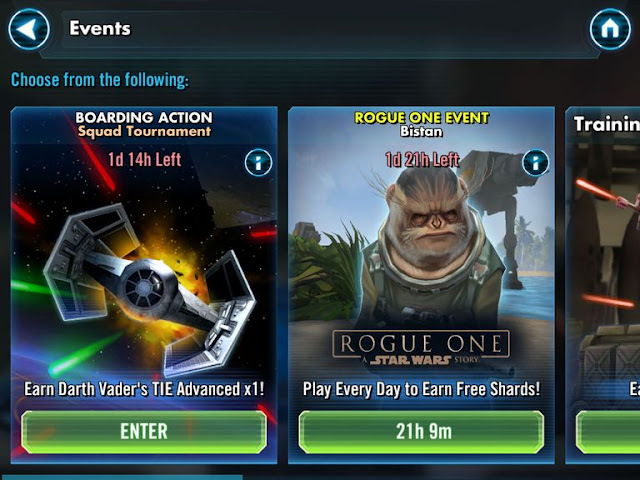 Even the new characters from The Force Awakens and Rogue One make appearances in special limited-time game events, a trend likely to continue with future Star Wars movies. 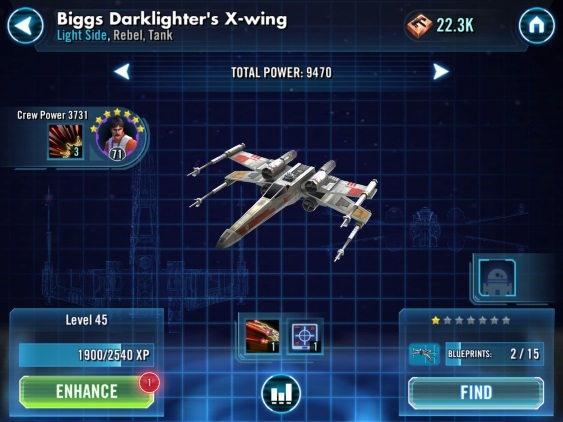 A recent update brings in some of the iconic ships from Star Wars, including the X-Wing, TIE fighter, Star Destroyer, even the Millenium Falcon. The characters and ships each have classes and unique abilities; tanks are damage sponges, attackers attack, support characters support, and so on. Abilities vary widely and the trick is to gather characters and ships whose abilities complement and augment each other. For example, Darth Vader, Yoda, Princess Leia, and other "legendary" characters possess so-called leadership abilities which enhance statistics or provide other benefits for your entire squad. Some abilities are buffs that can positively affect your character or their teammates. Teebo, an ewok tank, has a percentage chance to have your characters acquire the stealth ability for a few turns. Luminara Unduli in addition to decent damage-doing potential has a potent heal ability. Debuffs can have similar but detrimental effects, such as the Royal Guard's ability to stun a target or the irritatingly effective ability of Darth Sidious and others which prevents a character from being healed. Emperor Palpatine's lightning can deal damage to your entire squad in a single turn. A few exact a toll on their users, such as Talia's Water of Life ability which heals other squad mates at the cost of a percentage of her own health. 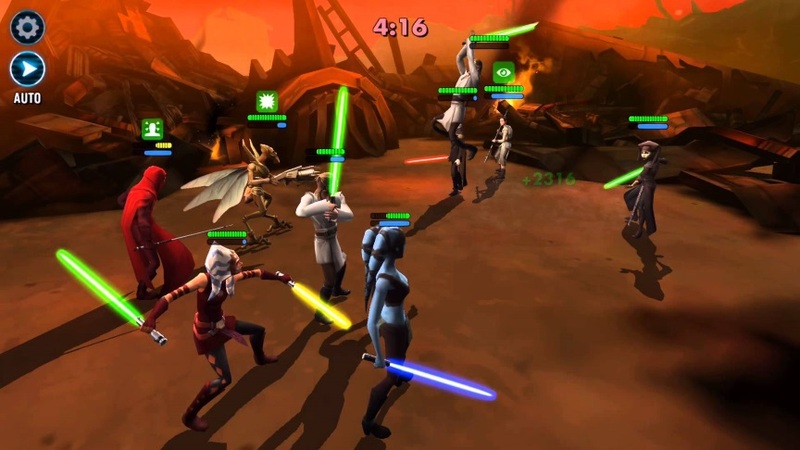 Star Wars: The Clone Wars animated series) makes an appearance in GoH. 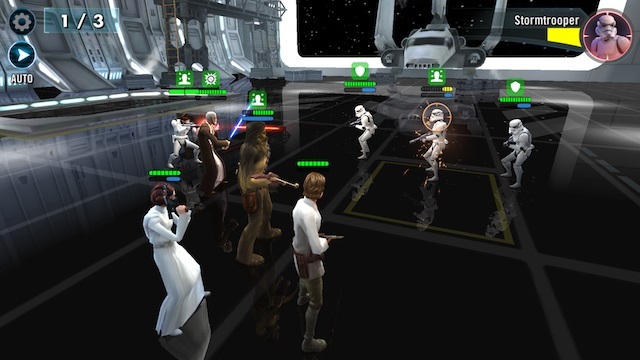 Gameplay involves turn-based combat with a squad of up to 6 characters you choose from among those available in your profile versus another squad controlled by the game, and battle consists of advancing through progressively challenging rounds of combat in various familiar Star Wars locales like Tatooine, the Death Star, Hoth, Endor, and others. Player-versus-player "arena" style combat with another character's squad is available, which really puts to the test your ability to create a squad that can handle the opposition. Helpfully prior to battle you can analyze the opposing squad's abilities and compose your squad accordingly. I really like the challenge of meshing character attributes and abilities. 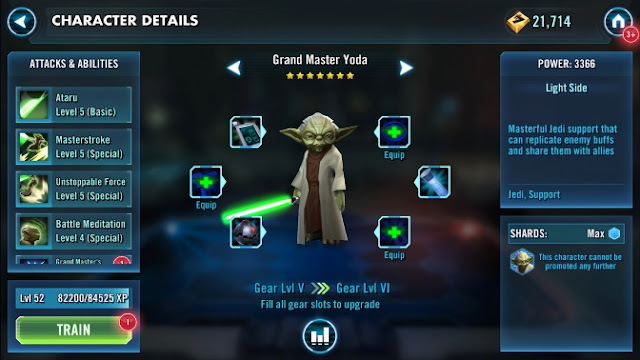 Rewards in battle include in-game currency (used to train your characters, purchase and equip gear and mods (bolt-on devices which are unlocked when your character reaches level 50), arena, guild and cantina credits (used to buy stuff in the arena, guild and cantina stores, respectively) and crystals, which can be earned through completing achievements and certain battles or events, or by forking over real money. The game, to EA's credit, is quite faithful to the Star Wars franchise. Visuals from the neon glow of light sabers to sparks as blaster bolts find their mark are wonderfully vivid and hearken to the movies. Sounds are similarly faithful, all that's missing are character voices as far as I'm concerned. Those players of Star Wars: Battlefront who appreciate its cinematic spectacle will probably be similarly pleased with this much smaller-scale game environment. Here unfortunately is where the novelty of the game ends. 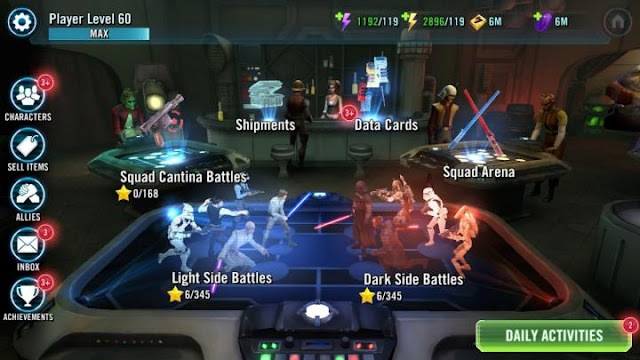 The cantina (depicted below) is the game's lobby. 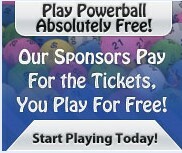 The idea is that you're a patron and you play the different games at one of the various holo-tables. Every time you visit the cantina it's the same thing, time after time. The decor is dingy and the ambient light dim. The twi'lek bartender (aside from being your guide in your earliest levels as a player) has a never-ending one-sided conversation with some dude standing at the bar. Two guys perpetually smack the table as their arena combatants duke it out. A droid mounted with a tray full of drinks trundles among the tables. Sound familiar? It reminds me of a divey Vegas casino, and the investment in time and effort unfortunately ends up being very similar to sitting at a slot machine. EA is notorious for exploiting the free-to-play model (the mobile reboot of Dungeon Keeper is just one example). While GoH isn't as obviously greedy for cold, hard cash, it still can be tempting to shell out cash to get that juicy legendary character or ship or refresh one of the numerous time-limited events. 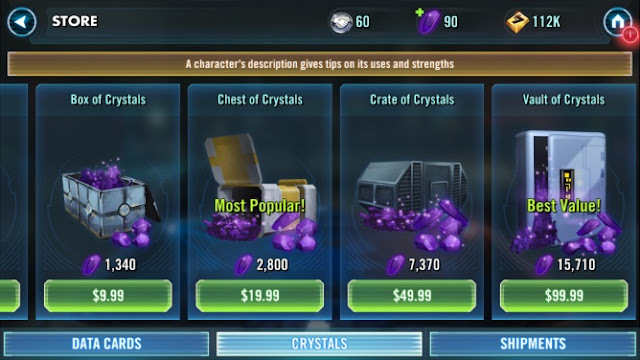 GoH is faithful to the Star Wars universe in some very obvious ways, but I'd argue a distinct lack of detail reveals EA's true focus is getting a crack at players' wallets. Take light sabers versus blasters. Any Jedi or Sith worth their salt could easily deflect blaster bolts, but here the I think the game developers could've gone the extra mile but don't, because there's no sophisticated light saber technique used to deflect blaster fire akin to how "real" Jedi for example do in the films. Instead of elaborate animations showcasing the art of light saber combat, you're given text messages like DEFLECTED. Ho hum! 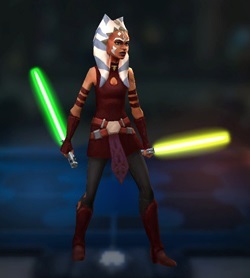 It's like EA delivers this game and says "Hey everybody, we have Star Wars characters! We have light sabers! We have visuals and sounds from the franchise!" Superficially yes, that's true, but it could be so much more. Similar to how the rebooted Battlefront compares to its old-school predecessor, there's a lot left to be desired here in terms of gameplay. Speaking of which, for someone who never has (and never will) plunk down cash money for crystals in this game, here's how a typical day plays out. Check mail for arena or guild or other bonuses and friend requests. Challenges / arenas. Play / sim, repeat until daily limit reached. Cantina / light / dark / mod battles. Burn through daily energy to meet daily goals. Guild raid. If available (highly dependent on guild participation), ~5 battles. Galactic war. Play until victorious or character pool decimated. Redeem credits, buy character shards, gear, mods, levels. Close to a promoting a character or completing a gear level? Spend crystals to regain energy, repeat step 3 until energy exhausted. Check achievements, redeem any available. When your player level is under 50 or so, your game day is over in under an hour or less. As currently level 81, mine takes a little over an hour, with much of that time spent putting my tablet aside and finding something more productive to do while waiting for the game's timers to reset. At least it isn't as maddening as the new Dungeon Keeper and that game's absurdly long build timers, but it's still sadly lacking in fun. Certainly, by design it has replayability; there's always that little psychological rush of completing a battle tier or maxing a character's level, which at least serve to motivate one to complete the daily activities. There's also satisfaction in collaborating with your guild mates to share in raid and other rewards, as well as help lower-level players fill their gear requests. Aside from these it lacks substance, and for myself and I'd wager many other Star Wars fans the visuals and sounds while certainly satisfying in the short term quickly give way to boredom. In the mainstream gaming market EA dwells (and sometimes takes a dump) in, this model of free-to-play is arguably the new normal, and that's sad. If and when I ever become a grandparent, I foresee myself wistfully sharing a tale with the grandkids about how many years ago you could pay for a game once and be provided hours and hours of fun, until the new normal and the almighty dollar helped free-to-play take hold, like cancer.